Volume 1, page 55, sitting number 426. Marie of Baden was the second daughter and seventh child of Leopold, Grand-Duke of Baden, and his wife, Sophie of Sweden. On 11 September 1858 she married Ernst, 4th Prince of Leiningen, the son of Queen Victoria's half-brother. They had two children, Alberta (1863-1901) and Emich (1866-1939). 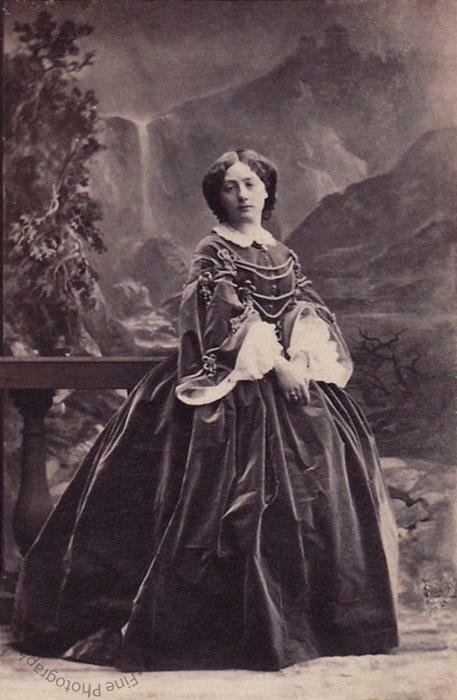 She died at Karlsruhe on 21 November 1899. Numerous British newspapers announced her death. 'The Queen has received the sad intelligence of the death of Her Majesty's dear niece, the Princess of Leiningen, which has caused her deep grief, as the Queen was devotedly attached to the Princess, who had often visited Her Majesty, and was beloved by all who knew her' (The Globe, 23 November 1899). Longer obituaries soon followed. 'The death of the Princess Leiningen is a sincere grief to the Queen, with whom she had always been a great favourite, and whom she had visited every year. The late Princess, who was born on November 20, 1834, was the youngest and favourite sister of the present Grand Duke of Baden. She was married to Prince Ernest of Leiningen, who is so well-known in England, on September 11, 1858, and during the forty-one years of her married life had endeared herself greatly with all his people. Her charity and many noble qualities had made her respected and beloved by all, and her sudden death is a great misforturne to her familiy and all those who had the honour of her friendship. The last years of her life were much saddened by the blindness of her only daughter, the Princess Alberta, who, since this great misfortune came upon her, has led a most secluded life. The Princess also leaves a son, the Hereditary Prince of Leiningen, who is married to his cousin, the Princess Feodora of Hohenlohe-Langenburg, and who is the father of one daughter and two sons. The present Prince of Leiningen is the son of the late Prince Carl, the half-brother of Queen Victoria, to whom she was very devoted (Windor and Eton Express, 2 December 1899).